South Lake Brewing Company recently began selling the Trail Builder Pale Ale. One of the largest components of Tahoe’s nightlife is the mix of countless breweries, bars and restaurants that offer unique drinks difficult to find outside the basin. In our new Drink of the Week segment, we’ll showcase one type of beer, wine, cocktail — you name it — to try during your stay in the region. 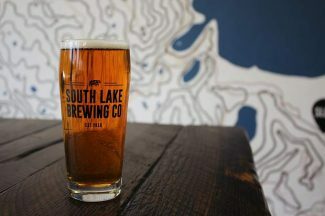 This week’s drink is South Lake Brewing Company’s new Trail Builder Pale Ale: Easy drinking and refreshing, it’s the perfect beer to enjoy after a day spent being active. The team’s take on a classic American pale ale includes notes of grapefruit pith, papaya, orange and lemon black tea that combine with a bready forefront to produce a light drink packed with flavor. “The small addition of crystal malt and flaked wheat create biscuity undertones. The slight maltiness drops away to let the Cascade and Idaho 7 hops shine,” states the drink description. At 5.4% ABV and 40 IBU the drink’s hops aren’t overwhelming, making the libation especially enjoyable for those of us who aren’t big on hopped-up drinks (I know, I know — shame on me). What stands out about the Trail Builder Pale Ale is that it’s brewed in support of Tahoe Area Mountain Biking Association: 10 percent of the draft sales in the tasting room are donated to the organization, which hosts trail building days in pursuit of its mission to maintain and advocate for multi-use trails in Tahoe. After tasting it, we can see why the new pale ale is served after a day of hard work. South Lake Brewing Company is located at 1920 Lake Tahoe Blvd. Learn more online at http://www.southlakebeer.com.